You will love this Instant Pot Pork Roast. It is very delicious and favorite family dish. Here, you will get the best recipe to make Instant Pot Pork Roast. 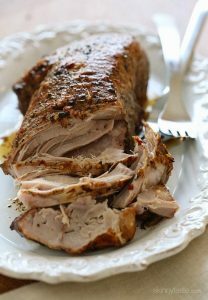 Pork Roast is very simple and easy to make. No doubt, the taste of this dish is amazing. This savory Pork Roast is best to make for family dinners and lunch. How to serve Instant Pot Pork Roast? You can serve instant pot pork roast with mashed potatoes and with gravy. It is quite juicy and tender. Feed your hungry crew and your friends with this finger-licking roast. The quantity of pork roast depends on your need, you can make small quantities as well as large quantities to entertain the whole family. Yes, everyone will love it. Instant Pot is the best! 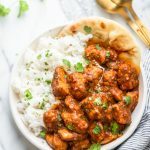 Normally a pork roast takes almost 4-5 hours to cooki n a cooking pan, but with the help of the Instant Pot you can cook it in short span of time almost in 20-30 minutes. 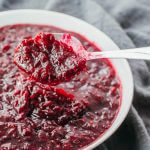 An instant pot is not less than a blessing for us. It keeps the taste of the food natural and healthy. 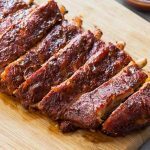 You can make a slow roasted flavor and tenderness in an instant pot in a short period of time. Does your Pork roast will dry out? This is the reason why I love my Instant pot because it will not dry out your pork. The slow and low action of the Instant pot will lock the moisture of the pork roast and will keep it juicy and tender. In fact, the taste of the pork roast will come out that it has been roasted slowly throughout the day. In short, it is an inexpensive method to prepare pork roast at home. So, let’s start with the ingredients and then we will move towards the recipe. First of all, season Pork loin with salt and ground black pepper. Select the instant pot settings to Saute, when the pot becomes hot add oil in it. Now add the pork and cook it from both sides until the sides become brown. It will take almost 2 minutes per side to become brown. Cancel the saute setting and add vegetable broth in an Instant Pot. Now closed the lid, set the pressure and set the instant pot at meat, stew. Let it cook for 20 minutes. After that quick release the pressure and let the pork roast to stay in the pot for 5 minutes. 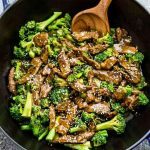 Open the Instant Pot lid, take out the pork and place it on the cutting board and cut it into fine thin slices. Check the internal temperature it should be at 145° F. Let the meat rest for 3 minutes. 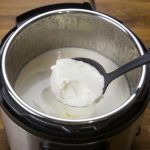 Now add the remaining cooking liquid in an instant pot and cook it until it reduces by half. Serve the thinly sliced pork roast with the sauce and enjoy the superb flavored Instant Pot Pork Roast. 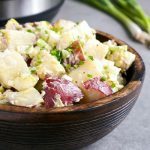 Delicious InstaPot Potato Salad Recipe! How to use Instapot? Electric Pressure Cooker!